Children aren’t little adults. Their disease processes don’t always mimic those typically seen in the adult population. This makes expanding CDI reviews to pediatric units or children’s hospitals a challenge—but every challenge is an opportunity. We’ve compiled a panel of contributors representing some of the most advanced thought leadership in the pediatric CDI realm today to provide an in-depth look at a wide variety of documentation concerns related to childhood conditions. Whether you need help securing administrative support from the get-go or want some guidance on delving deep into the documentation depths, this book provides the building blocks to get your pediatric program off the ground. 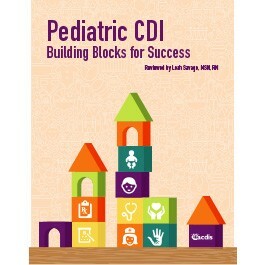 Pediatric CDI: Building Blocks for Success is a must-read resource for both new CDI specialists and experienced CDI specialists who have pediatric chart review added to their responsibilities. Use this book to expand into the pediatric setting or to take your existing pediatric CDI efforts forward and improve documentation, coding, quality, and reimbursement.